You are currently browsing the category archive for the ‘Project: Quilt’ category. I labored hard last week to finish up the patchwork top to the quilt—I was so excited about seeing the finished product! Now it’s finished and this coming week I’ll be able to begin work on putting the batting, back fabric and edging on the quilt—yay! 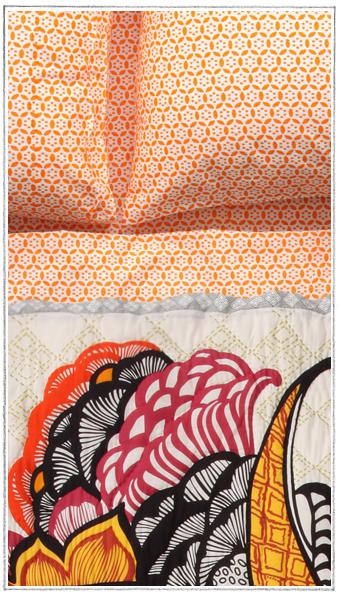 Also, last week I received a lovely e-mail from Anthropologie with their new mix & match website feature for bedding. Choose from pillows, sheets, quilts and duvets to get your perfect look. 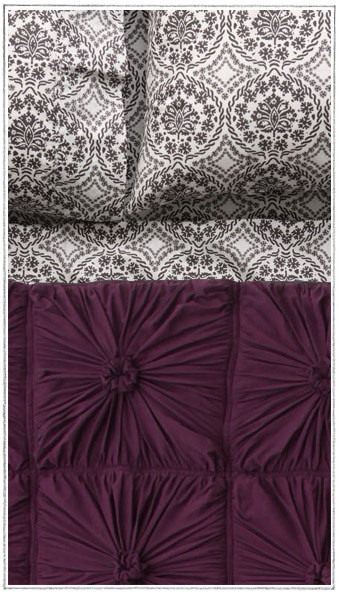 Here are two of my favorite combinations—you’ve just gotta love their quilts and duvets! Quilting Update :: Week . . . um . . . 8? The quilt had been on multiple bouts of “on hold” statuses since mid-July, but I’m back in business! I’m pretty sure it’s week 8 but if you want to get technical, it’s probably like week 28 or something! Sunday evening I whipped out the sewing machine, picked up where I left off, and finished stitching the patchwork squares into strips. Only a few minor mishaps with the machine, but I finally was able to finish up the last 10 or so strips and start stitching those strips together. After a lot of seam ironing on Monday, I was able to almost finish pinning then piecing together the patchwork top. Not all my patchwork corners match up perfectly, but in my opinion it’s a good first attempt. After laying out the pattern of squares, apply a small piece of masking tape with a number written on it to the beginning of each row. You can make stacks of the squares with the number on top so you remember which row is which. This was my sister-in-law’s idea, and it was genius! When pressing the seams in one direction, keep in mind how the seams will go through the machine when sewing the rows together. 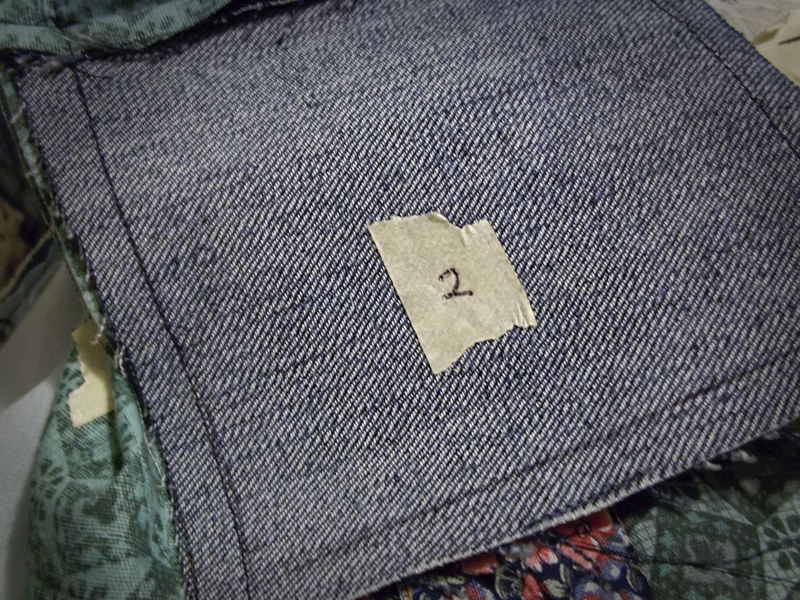 Use the tape numbers as a guide—either press away or toward the tape for each row (depending on which way the row goes through the machine). Make sure the bobbin is full. It’s killer to find out you only thought “stitched” an entire row but the bobbin thread ran out two squares in. The more rows that are joined together, the more weight is going to be pulling while you stitch. Working at a larger table so you can keep the patchwork up and level with the machine is helpful. I’m back to blogging! And according to my records, I think this should be week 7 of the great quilting quest. However, with two Sundays gone on vacation, and my sister-in-law Kelly off to traveling for the next month, we have no progress to report on the quilt. Sorry about that. 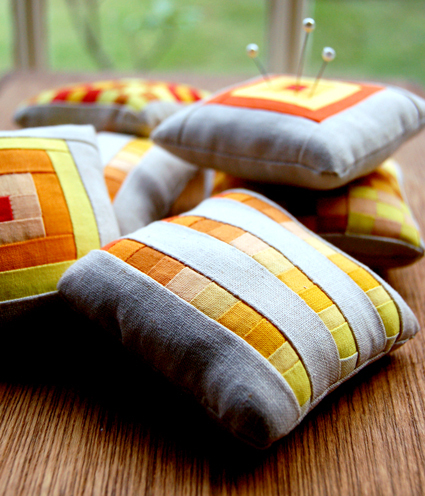 Patchwork Pincushions by Molly of Purl Soho. A great way to make quick work of small scraps and to practice your patchwork without commiting to a whole quilt. Celebration Pennant by Stitching in Striped Socks of Etsy. Not really traditional patchwork, but a fun project nonetheless. Wee Three Birds Quilty by The Bobbin's Nest of Etsy. I love the applique on this quilt! Really fun and creative for a kid's room. "Roots" quilt in Ginger by Denyse Schmidt Quilts. Denyse makes some beautiful art quilts. I love the shades in this one. Wedding Wheel quilt by Jen of Purl Soho. Jen used leftover table linen fabrics from her wedding to fashion this quilt. What a wonderful memento of her special day! Martha Stewart’s Encyclopedia of Sewing and Fabric Crafts, page 23. If you’ve been following along with my sister-in-law’s and my quilting quest this summer, than you’ll know that we’ve been pinning our hearts out in putting together a patchwork top. Two issues arose from this. The first is that you can never, ever, EVER have enough pins when you are quilting. The second is that you will invariably need someplace to store all those pins. My mother-in-law had a great magnetic dish that she bought and let us borrow for stashing pins between use, and that brought me back to the EOSFC once again. While I was perusing the opening pages, I had seen how to make your own magnetic dish and this seemed like the perfect opportunity to experiment with this project. 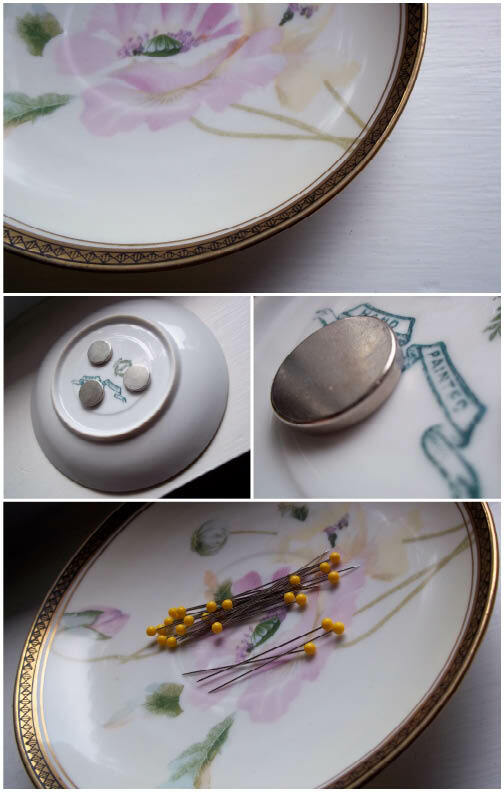 The project took all of about 5 minutes, and solved another problem of mine—what to do with a vintage tea saucer I had from my great aunt. While I love the handpainted dish, it just sits around in the drawer where I can’t admire it. I also don’t drink tea from china cups that often. 1. You need super glue. I like Gorilla Super Glue. It’s “impact tough” and completely dries in 30 seconds—less time for it to get all over my fingers! 2. In the EOSFC, they used a small dish with one slim magnet. I couldn’t find any extremely slim, large magnets in my local craft store, so I used three equally spaced magnets. It also allowed for more magnetic surface on my larger dish. While I took most of the afternoon off to swim, Kelly sewed several more rows of squares – thanks Kelly! I took over and sewed about two rows and pressed the seams. We still have a few more rows to sew next week. Just a few pics of Kelly and I laying out the quilt and testing out my new camera. The flash was too bright for me. Don’t worry, the fabrics look weird because they’re wrong-side down. Hopefully it will look alright in the end, fingers are most definitely crossed! I just got back from a lovely afternoon at my in-law’s house, which was also week three of the quilt project. Again, great progress was made – although sincere apologies must be said for our taking up the entire living room floor with quilting squares. Today we laid out all the squares into our desired pattern (nothing strict, just aesthetically pleasing to us) and then we began to pin the squares into rows until we ran out of pins. Note – if you’re going to embark on a quilting venture, you should be prepared with thousands of pins, not 100. To free up more pins, I began sewing the squares we’d already pinned. This was quite a venture seeing as how I haven’t used a sewing machine for approximately 11 years. At which time, that sewing machine was about 20 years old. Getting back into the swing of things was a little tough, and it took Kelly and I a small measure of time to set up the machine, get the bobbin working right, figure out why the foot kept falling off (secret lever!) and get it to be functional for us. I can happily tell you that by the end of this process I will be a pro at sewing straight lines! 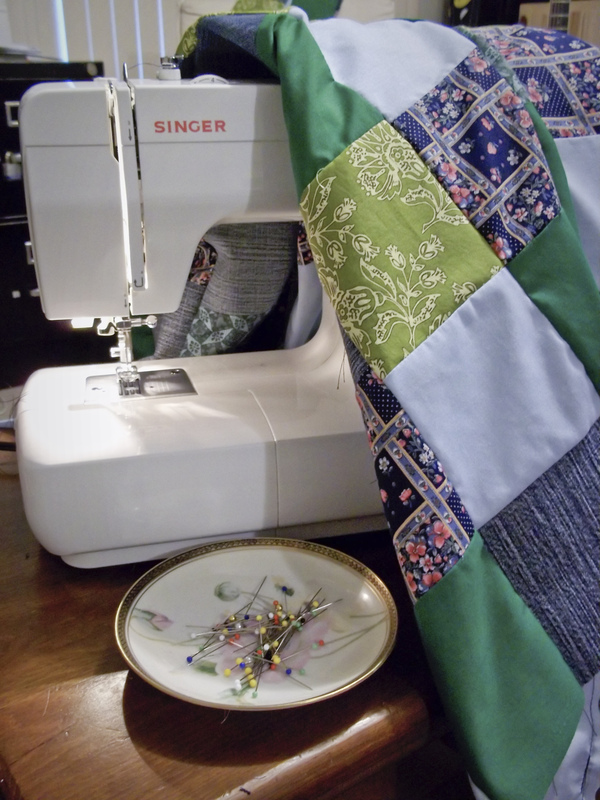 Next week in the world of quilting – we will continue to pin and sew the rows. So Kelly, my sister-in-law, and I are off to a great start after two Sundays now of work. We managed to get all of our quilt squares—all 216 of them—cut out. Let me tell you, it was a daunting task. Now for pressing, pinning and stitching them together. At least one of those tasks involves a machine!